Today we push on in our search for good drinking water. It looks like Klemtu is our best option. We left Emily Carr Cove near 9AM slack tide, retracing our inbound track through the tight entrance. Our stabilizers easily handled the low swell of Caamano Sound. We followed Laredo Channel then Laredo Sound with its ocean swell into Meyers Passage, over the top of Swindle Island, past Boat Bluff lighthouse to the Klemtu Indian Village. During our cruising we occasionally come across “yaks” and “yakkers” (aka kayaks and kayakers). At cruise speed. Wild Blue's boat wake is large, and its waves could easily topple an unsuspecting yakker. When we see a yak, we typically slow the boat to reduce the wake until we have overtaken them. We also slow down when cruising near smaller boats. Today we meet a yakker who asks us to please speed up! 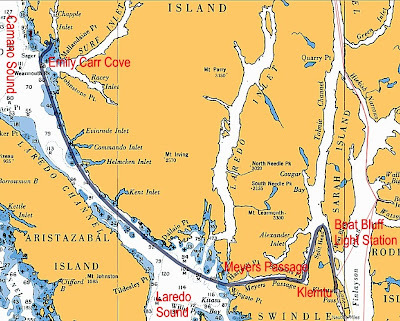 Our route through Meyers Passage was smooth after Laredo Sound's ocean swell. 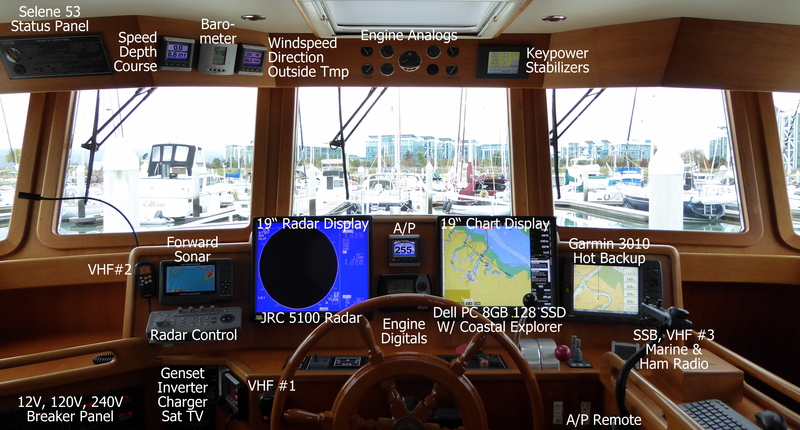 The Passage is an easy motor, except for the one-mile shallow, kelp filled shoal at Meyers Narrows. At low tide, the Narrows had a least depth of 6 feet giving Wild Blue six inches of water below her keel. Fortunately we timed our passage at a higher tide of plus 9 feet and had depth to spare. After rounding the top of Swindle Island and turning south towards Klemtu, the channel takes us past Boat Bluff lighthouse. Canadian light houses are staffed with a full-time keeper families. 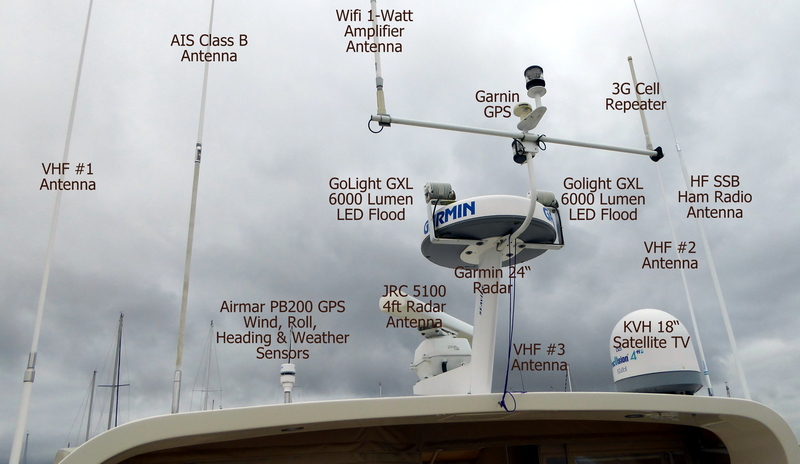 Boat Bluff is special because the family that lives there offers free wifi to passing boaters. There's no cell service for many miles, so on a busy summer day, the channel can be crowded with stationary boats connected to the lighthouse's wifi checking email, browsing the net, or like us, making Skype phone calls. Boat Bluff Lighthouse: Central BC's guiding light to the Internet! Just three miles south of Boat Bluff we came to Klemtu, a small Indian village of about 500 persons. 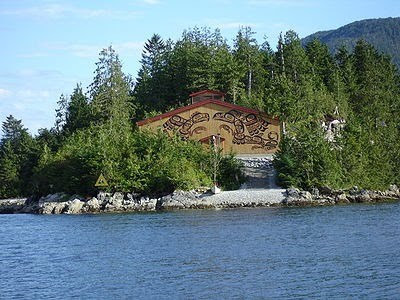 Klemtu is the home of the Kitasoo and the Xai'xais people. These two tribes live together and are jointly governed. We docked our boats and toured the tribe's new longhouse. The tour was given by a tribal elder named Daniel. Not many boats visiting Klemtu today. Look closely, there are three boats in this photo. Our view from the dock of Klemtu's new longhouse. Nice carvings on the inside. Leah Blok next to tribal talking stick, is owner of the 3rd boat docked at Klemtu. She is kayaking from Skagway to Vancouver. The dock had looked empty but there was a boat already docked there as you can barely see in the above photo. It was a single kayak owned by “yakker” Leah Blok. Leah and her “yak” rode the ferry from Vancouver up to Skagway, Alaska and is kayaking home! She does about 20 to 30 miles a day, depending upon the tides. Unlike others, she likes BIG boat wakes as they are way fun to ride. In the evenings, she sets up camp with a tent, somewhere along the shore. One of her favorites so far was kayaking up to North Sawyer Glacier face in Tracy Arm. To keep her mom informed, she carries a Spot satellite transponder which records her location each day. And what does this young woman do for a living? She is a kayak tour guide, of course. Bonnie, Ron, Leah, Pat and Alex enjoyed great conversation over spaghetti aboard Wild Blue. We promised Leah we would increase our RPMs creating a BIG wake for her to ride when we see here again. The pictures and description shared about the places is really very interesting and fascinating to go through.It would be a great pleasure spending vacation on some such kind of beautiful marvellous place with my husband and kids.